James Bloodworth is one of the few writers around who is as committed to human rights abroad as he is to economic democracy at home. In fact, he’s for both everywhere. This marks him out among a commentariat which, depending on ideology, will either neglect issues of class and inequality, or explain away the crimes of foreign dictators. For Bloodworth, politics is a struggle for power, where the real enemy is those who would bully and exploit, whatever their party colours. This key insight, I submit, is the engine behind the success of his second book, Hired (Atlantic Books 2018), which applies his study of totalitarian regimes to the rough end of the labour market in free societies. (I should say at this point that Bloodworth is a friend, and was my editor at Left Foot Forward.) Aside from his on-the-job research, Bloodworth has read up on poverty, weaving into his narrative bits of history, proletarian poetry, and management theory (old and new), along with literary allusions from Dickens to HG Wells. The result is a rich but easily digestible meal, with hidden nutrients and seasonings. Hacks also compare Bloodworth’s field work among the proles at various crummy jobs - Amazon “picker”, call centre operator, care worker, Uber driver - with George Orwell’s research forThe Road to Wigan Pier. But a more interesting sign of Orwell-influence is Bloodworth’s pulling apart the folded lies in the language of his employers. For example, Amazon rebrands its warehouse a “fulfilment centre”, from where you are not sacked but “released”, and where boss and worker are dubbed “associates”. This corporate newspeak is more than just an offence to language. Gig economy firms Uber and Deliveroo have defended in court the ludicrous claim that their drivers and couriers are independent contractors, and are thus not entitled to basic employment rights, such as sick pay and regular hours. As Bloodworth points out, the term “gig economy” is itself a tricksy one, evoking “images of fame and insouciant swagger - like a guitar-wielding megastar bestriding the stage” who can “roll lazily out of bed and turn up to a ‘gig'” at their leisure. In reality, their work is tightly controlled, with punishments for minor transgressions. While giving his interviewees space to talk, Bloodworth doesn’t shirk from challenging their opinions. His passages on the injustice of blaming immigrants for the hardships of working class Brits are some of his best and most admirable. Though again, he’s not afraid to say that having an influx of labour from Romania and elsewhere allows for a kind of double-exploitation – first of the newcomers, who for language and cultural reasons are not likely to join a trade union, and second of the British workers, who face a tighter labour market and lower working conditions than they know to expect. Bloodworth’s style is that of direct and thoughtful reportage, but the plain surface conceals technical skills - those of storytelling and description - picked up from the great social novels , giving his writing a sturdy architecture. He also has a talent for creating vivid similes to make you really see his point. It’s hard to think of a better evocation of being dropped from Amazon’s employment rolls than being cast aside “with no more compunction than if you had been a sack of rotten potatoes”. And it’s one thing to say you do a lot of walking in the warehouse. But it’s a stroke of brilliance to count your paces, and then calculate that in a week you will have walked the distance from London to Dover. Bloodworth clearly has a real feeling and affection for England and its people - a trait he shares with Orwell, who believed that love of country was the essential quality in a revolutionary. And like Orwell, Bloodworth has reflected on the strange appeal of totalitarianism for people living in free societies. (See for example his work on Cuba, Russia, and Jihadism for Little Atoms.) It’s this grounding which allows Bloodworth to liken the world of work in a democracy, to life in a political tyranny, without sounding ridiculous. For a start, he knows that if Britain (or Amazon) were really like a totalitarian state, he couldn’t have written this book. In other words, if you want to effectively criticise modern capitalism, you need to be sound on the question of democracy vs totalitarianism. This may sound easy, but you would be surprised how many writers and politicians fail this test. So to the populists, whom Bloodworth correctly accuses of exploiting the kinds of problems he has chronicled, and of taking advantage of the failures of successive governments. This rather argues a corollary point to my earlier one, namely that opposing authoritarianism will require serious remedies to the problems of modern capitalism. As against the hot air of the demagogues, and the Left’s “rigid dogmas” and romantic posturing, Bloodworth calls for workplace organising around the “boring stuff” of workers’ rights. In doing so, and in the way he does it, he upholds a worthy tradition, without joining the current beeline for the past. 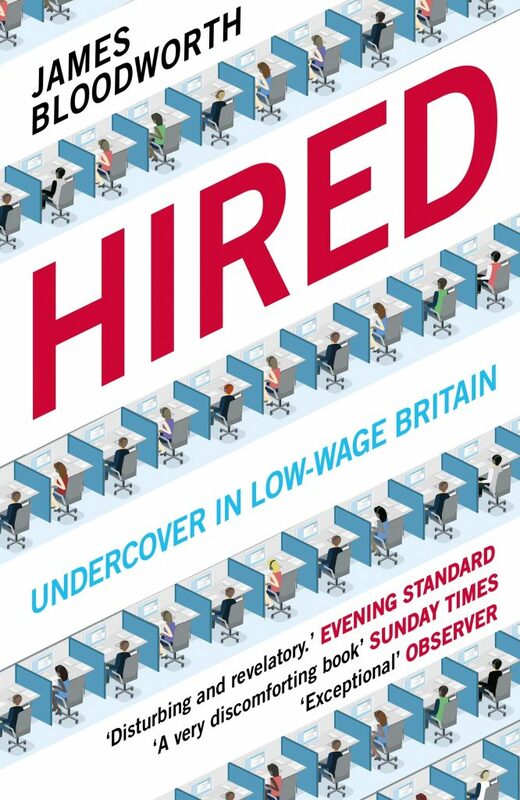 Hired is available now from Atlantic Books and will be out in paperback from February 2019. Next When Labour defends racists and tyrants, how can it fight injustice?